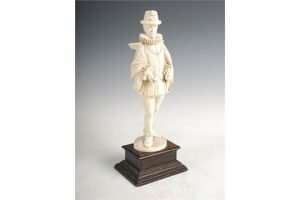 A late 19th century ivory figure of Sir Francis Drake, possibly Dieppe, carved standing wearing a feathered hat and ruff collar, on a rectangular wooden plinth with foliate carved detail. 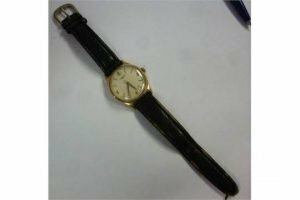 A Longines 9ct gold cased wristwatch, the movement with sweeping seconds, faced by an Arabic and baton dial, on a stitched black hide strap. 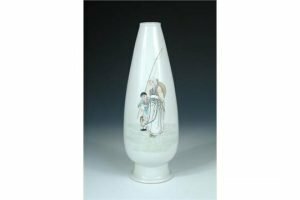 A Republic Period vase, the slender ovoid body painted with an elderly sage accompanied by a boy with fishing rod and fish above a flared cylindrical foot. 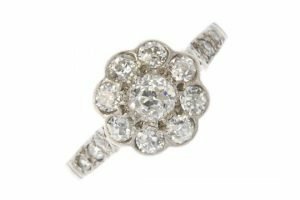 A mid 20th century 18ct gold and platinum diamond floral cluster ring, the old-cut diamond, with similarly-cut diamond scalloped surround, to the single-cut diamond shoulders. Estimated total diamond weight 0.95ct. 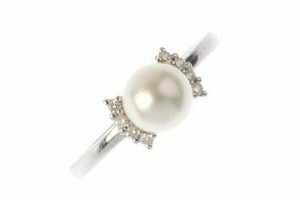 A cultured pearl and diamond dress ring, the cultured pearl with brilliant-cut diamond curved sides, to the plain band. 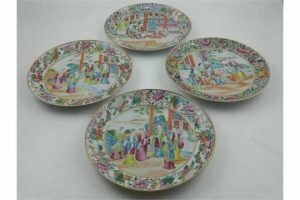 A set of four 19th century Chinese famille rose Cantonese plates, all decorated with circular panels of a gathering figures in a courtyard terrace scene. 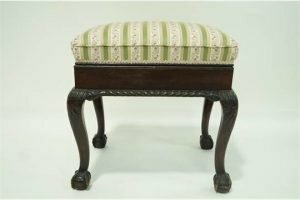 A rectangular piano stool on carved cabriole legs, and ball and claw feet. 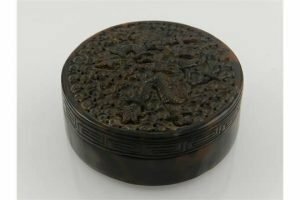 A 19th century Chinese tortoise shell circular pot and cover, decorated with twin confronting dragons. 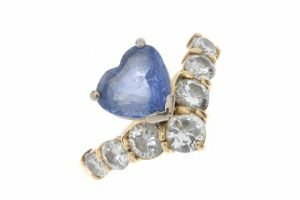 An 18ct gold sapphire and diamond dress ring, designed as a heart-shape sapphire, to the graduated brilliant-cut diamond chevron and plain band. Estimated total diamond weight 1ct. 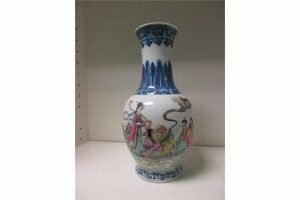 A 20th century famille rose vase, the waisted neck of the baluster shape with wave and stiff leaf bands above the body painted with the Daoist Immortals in a willow tree trunk boat, another riding a red cloud towards them, six character mark of Yongzheng. 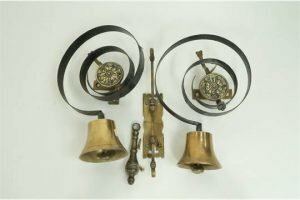 A pair of 19th century brass bells, each with spirally wrought iron and brass rosette pull attachments. 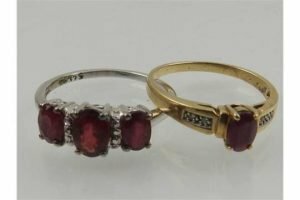 A 9 carat white gold and three stone ruby ring, together with a 9 carat yellow gold and single stone ruby ring. A 9 carat yellow gold and sapphire pendant, set with diamond accents, together with a matching pair of 9 at yellow gold and sapphire drop earrings. 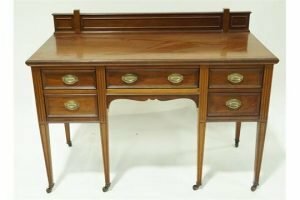 An Edwardian mahogany writing desk with raised back, an arrangement of five drawers with brass handles and square tapering legs on casters. 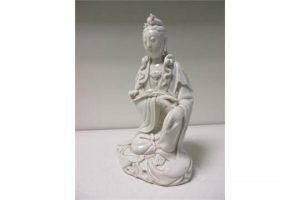 A blanc de Chine figure of Guanyin, Dehua seal mark, she sits with one knee raised to support her left hand while the right holds a ruyi sceptre. 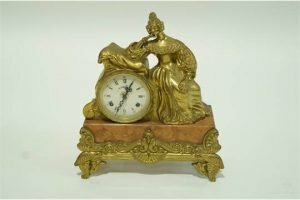 An early 20th century German mantel clock with enamel dial, brass and marble case. 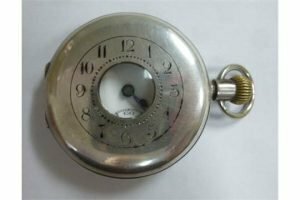 A silver cased half-hunter pocket watch, engraved with an Arabic dial around a bullseye glass window, the keyless Lagaros movement faced by a white enamel Roman dial with subsidiary seconds. A 14ct gold tanzanite and diamond ring, the oval-shape tanzanite to the baguette-cut diamond line shoulders. 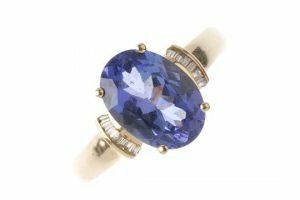 Estimated tanzanite weight 3.15cts. Estimated total diamond weight 0.10ct. Hallmarks for London. 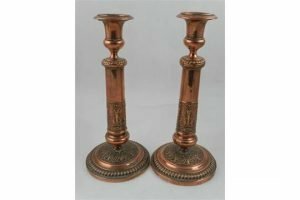 A pair of early 20th century French copper candlesticks, the stem embossed with foliage. 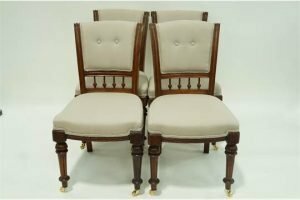 A set of four Victorian chairs on turned tapering legs with later brass casters.